One of the largest military bases the USSR ever had on foreign soil – a settlement with dozens of apartment blocks – has been captured on camera by a drone. The impressive video shows a mega-compound, abandoned 20 years ago, gradually succumbing to decay. The enormous military base of about 2,000 hectares (almost 5,000 acres) is in the woods near the German village of Vogelsang, 65 kilometers (40 miles) north of Berlin. The construction of the closed-off compound for the Soviet Army’s 25th Tank Division started in 1951. At the core of the facility were warehouses for tanks, all-terrain vehicles, anti-aircraft missiles and even nuclear weaponry. The residential part of the base was built to accommodate 15,000 people, including soldiers and their families. Inhabitants of the military settlement never had to leave the cordoned-off area, which had its own school, shops and cinema. 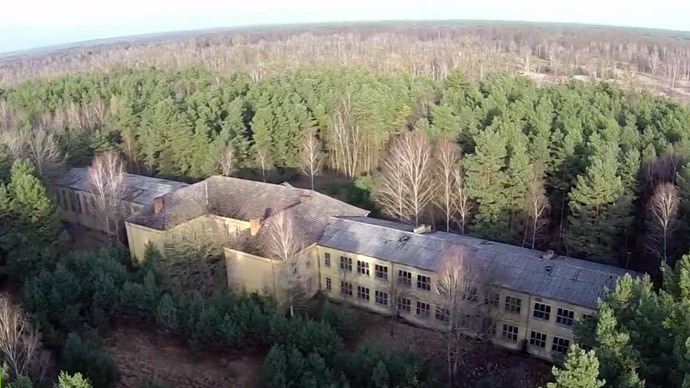 The Brandenburg forest is now gradually taking over the military base, but there are still a lot of curious remnants of the past Soviet life to be found by adventurous explorers sneaking inside. Among the treasures are picturesque Soviet murals on the walls of an abandoned school. The Ruptly video agency crew, which filmed inside the base, was lucky to discover some military boots, an old suitcase and a 1986 newspaper.